How many of my readers have sparse eyebrows and is sick and tired of filling them in every single day?? Cause I know I am. I’m going to share with you my favorite eyebrow products and my recent discovery that will solve your problem. For the past few months, my favorite go-to eyebrow pencil is from KIKO MILANO. This store is located at almost every mall I’ve been to in New Jersey. If you have trouble finding one located near you, they have a website that I’ve attached above! This Precision Eyebrow Pencil is my holy grail and I LOVE it. The color pigmentation is ahhhh-mazing and the price is a steal! ($9.99) The product is almost as great as the Anastasia Eyebrow Pencil, which is crazy. I would recommend this product to anyone of my friends/family/readers/anyone, and I know anyone would love it too. 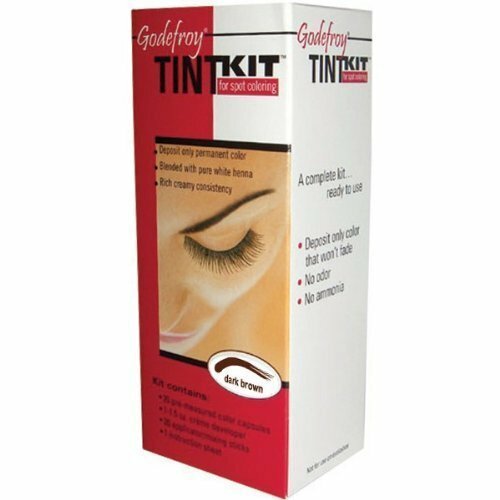 The Godefroy Eyebrow Tint Kit is sold on Amazon, Ebay, and in some stores. The price for the eyebrow tint varies from $10-13, but it comes with a large amount of product. Each box comes with a: 20 Pre-measured Color Capsules, Cream Developer 1.5 oz, Reusable Applicator Brush, Mixing Cup, Instruction Sheet. It claims that it lasts for uses, but each capsule can be used for several applications and you can’t keep it after you’ve mixed it with the cream developer. So, here’s my little tip for you: Go to the dollar store and purchase a contact case – open the capsules and pour 2 in the left side, and pour in some cream developer in the right side. So, here’s my little tip for you: Go to the dollar store and purchase a contact case – open the capsules and pour 2 in the left side, and pour in some cream developer in the right side. For each application, use the brush included and scoop out a little bit and pour it into the mixing cup; repeat the same process for the cream developer. Mix the mixture into a creamy consistency and start dabbing on your eyebrows. Leave it on for 1-2 minutes, wipe it off with warm water and pat dry with tissue. Mine lasted for a week, which is pretty good for me! Let me know if you end up trying this product on your own and your feedback on it! COCONUT OIL! This is my holy grail of all beauty products. I was really skeptical about using it as a moisturizer because I didn’t want my skin to feel greasy afterwards. But my skin feels AMAZING afterwards and smells awesome too. It keeps my skin moisturized all night and all day, which is better than name brand ones like: Aveeno. I use it as my daily moisturizer on my face as well! Drops of Youth from The Body Shop. This serum is organic and it really helps restore bounce in my face. I would recommend this product to anyone that’s trying to cut down cost from purchasing high-end face serums, this works just as well. Plus White 5 Minute Teeth Whitner. You can buy this at your local Walmart for about $10 or less, and this really does work! This is definitely an inexpensive way to whiten your teeth without the splurge. Sample Clinique Barbie Pink Lipstick. I got a chance to try out this clinique long lasting lipstick in a similar shade of Barbie Pink (I’m not 100% sure what the color name is called!). Usually I’m not a big fan of pink lipsticks, but this color is GORGEOUS!! Jergens Gradual Glow. I LOVE this stuff! I use this once a week mix in with my spf daily moisturizer as my base, and I have a tanned face for a whole week. Since I only use it once a week, my face does not turn orange or anything, but it gives me a beautiful glow. What are some of your favorite beauty products? ?